Have you been looking for shoe to help you strengthen your feet more naturally? Vibram Fivefingers® assists the natural form and function of your foot. What are these unique looking shoes? 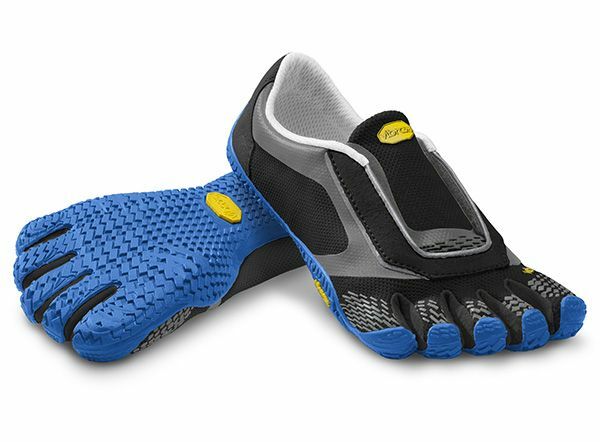 Vibram FiveFingers makes fun and colorful footwear for all types of activities in all sizes! We believe that moving and running in FiveFingers can make us healthier, happier, and more connected to our bodies. We hope the following information will help you discover how YOU can safely explore the joys of natural movement. Wearing FiveFingers for running, fitness training, water sports or just for fun will make your feet stronger and healthier—naturally. To learn more, go HERE. 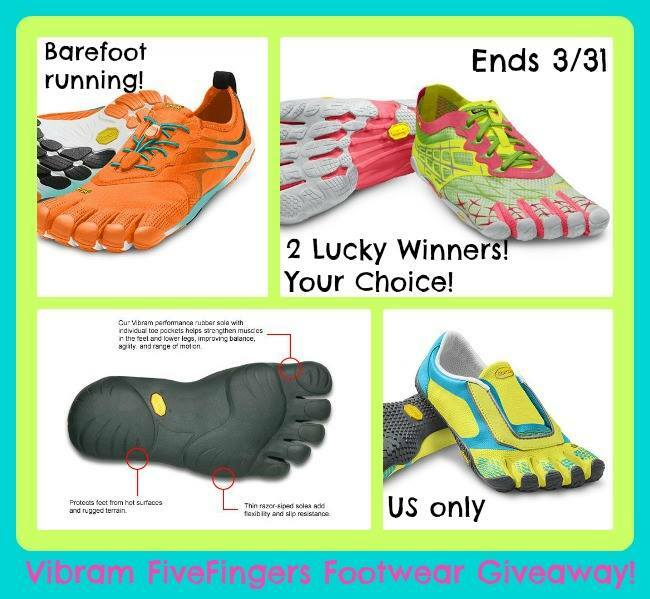 Two lucky winners will win FiveFingers footwear of their choice! I would choose the Spyridon shoes! Whoops, I accidentally put the same review I commented on twice in that entry. The second one should be for the Catty Stack. Thanks! I would really like the Lontra which only come in one color combo. Now, if I could afford it, I think I would have several different styles for different moods:). I think I would get either the KSO EVO or women’s Speed. Thanks! The treksport. Thanks for the chance! I would choose the Bilika EVO in black/yellow/magenta. They look really cool. TrekSport to gift to someone special. I would like the Women’s KSO EVO. I would pick the black and blue ones. I would choose the KSO EVO! I would love the KMD Sport LS. Bikila LS in Pink an I would also like to comment on how well an organized your page is an alit of variety! I would choose the spyridon multi – use pair! I might go with a kid’s pair for my nephew’s birthday! He’d love them. If I won this I would choose SeeYa LS Night. I’ve been wanting to try these ever since I read Born to Run. I would choose the Women’s KSO EVO. They’re really nice looking shoes. I think I’d go with the Bikila LS. I’d pick the SeeYa LS. These are truly wild! I love them and they would be fantastic at the beach. I love the women’s trek-sport sandal. I would get the KMD Sport LS Barefoot Fitness. I would love to have the Women’s TrekSport Sandal in Grey / Aqua / Black. These would be ideal for the camping trips we have planned for later this year. I love the Five Fingers Speed Womens! That’s a tough decision! I like so many of them! But I think I would choose the Women’s VI-B! I’d pick the men’s KSO style for my son. These shoes look so cool,I would love to win a pair,thanks so much for giving me a chance to win these.